Located inside of an old beachside motel is Salt Coastal Outfitters. 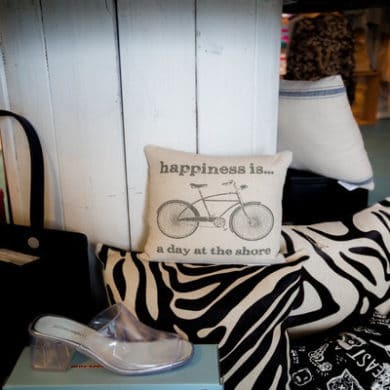 Salt is a beachy boutique with lots of cool clothing, jewelry, and knick-knacks from near and far. The best part? No beach kitsch! Jon Butler, the Owner of Salt, gave us some insight. And according to Jon, he doesn’t have to look too far for one of the best sellers. The store is incredibly unique as you make your way through the labyrinth of clothing and gifts. The interior has remained true to the origins of the building, so if you feel like you’re shopping in a kitchen, that’s because you are. Jewelry and ladies clothing makeup a large portion of the business, but the fellas still have plenty of reasons drop by. With plenty of sunglasses, clothing, hats and more, there’s definitely a suitcase stuffer for everyone. When we asked Jon about his keys to success, he claims that it’s all about going back to basics. And Jon even has his own catchphrase. We took his advice and have been ‘salty’ ever since. We think you should too. Salt is located at 25122 Perdido Beach Blvd #6, Orange Beach, AL. For more information, visit the Salt website or call (251) 215-9454.